Strawberry Chic: "Too Much Chocolate Cake"
Last Summer I was able to make a wedding cake for my cousin's wedding. We had loads of fun taste testing different chocolate cake recipes and decided that This One was the winner. The recipe used a simple devils food boxed cake mix but added a few special ingredients like chocolate pudding, sour cream, and chocolate chips, which added a delightful twist and made the cake extra moist! 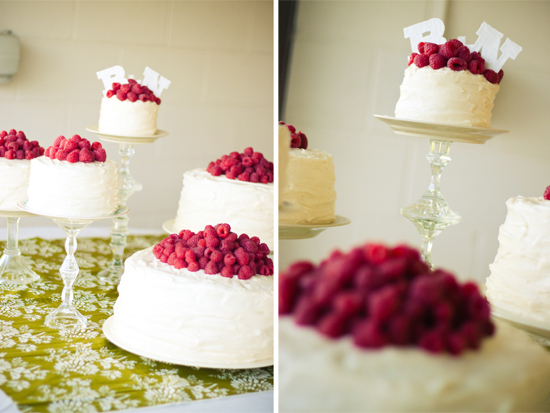 The cake was layered with a homemade raspberry filling, coated with a lite cream cheese frosting, and topped with fresh raspberries...delicious. The design of this cake was both simple and elegant. The original recipe used a bunt cake pan, but it can work with any other cake pan as well. I simply did a 'messy' look with the cream cheese frosting by swishing my frosting around in horizontal movements with my icing spatula and then added piles of fresh raspberries to the top. 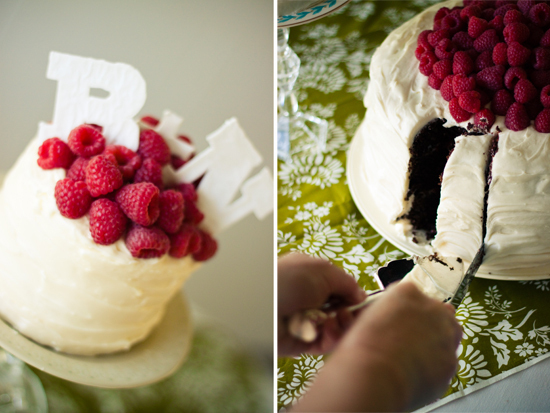 The B+N monogram cake topper was also a simple design. I first printed the text (B+N) on normal computer paper and then placed a sheet of baking or wax paper over the top. I then traced the text in royal icing by using a pipping bag and used the flooding technique to fill in the center. (similar royal icing flooding technique used here). If any of you are planning on making this cake or something similar, I have a few suggestions for you. If you are serving this cake at an outdoor event or even on a hot day allow the cake to sit in the refrigerator or freezer until served to prevent the frosting from sliding (cream cheese frosting is thinner and will not keep its shape as well as buttercream frosting). Also know that the raspberries will die the frosting red, so unless you prefer the look, add the raspberries just before serving. Are you going to share the recipe? it was delicious! you are the best, and this blog is so cute! Debbie, the recipe is a link within the paragraph. Just click on the word "this one" and it will open up. or go to http://allrecipes.com/Recipe/Too-Much-Chocolate-Cake/Detail.aspx. Oh that sounds like it would taste amazing. I love your blog!